At least a dozen officers swept into his Santa Clara home, their assault weapons and service guns drawn. This wasn’t a drug bust. Police were looking for a stolen $300 dashboard camera that was never found. 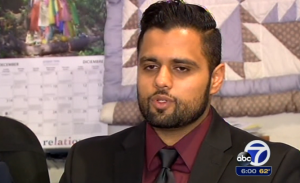 The subject of the search, Homeland Security Agent Mohammed Moneeb, is accusing Santa Clara police of targeting him and using excessive force because he is Muslim, ABC7 News reports. Police dismiss the claims, saying such a search isn’t unusual when a federal employee is accused of theft. “This response was within our procedures in investigating law enforcement officers, especially in this case, being a federal law enforcement officer. We have the public trust in this case and we believe the public holds us to a higher standard and theft in this case is pretty serious,” Santa Clara Police Department’s Lt. Kurt Clarke said. Federal authorities said an internal investigation is ongoing. Moneeb said he was shocked by the police response. “This has been a pretty traumatic experience for our family,” Moneeb said, who believes that the police were out of line. Posted: 12/24/14 at 9:20 AM under News Story.